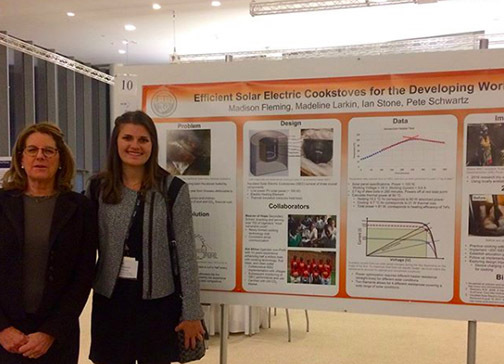 SAN LUIS OBISPO — A Cal Poly industrial technology major won the student poster competition for a presentation on insulated solar electric cooking at MIT’s sixth annual Clean Energy Education and Empowerment (C3E) Women in Clean Energy Symposium. Fleming is part of a team researching solar stoves for the global poor through Cal Poly’s appropriate technology courses. Small solar panels power a slow cooker and eliminate deadly emissions from open fires often used for indoor cooking, she said. Globally, 4 million people — mostly women and children — die each year from illnesses attributed to indoor cooking pollution from burning coal or biomass. Schwartz worked with Fleming and 10 other students to coauthor research on solar stoves — titled “Insulated Solar Electric Cooking: Tomorrow’s healthy affordable stoves?” — that appeared in the journal Development Engineering. Several members of the team were recipients of Cal Poly’s Frost Undergraduate Student Research Award.